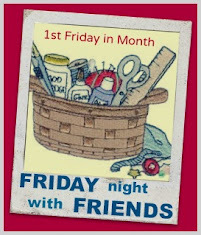 Sugarlane Designs: Our FNSI winner for March and a sneak preview of the new Sugarlane B.O.M. Our FNSI winner for March and a sneak preview of the new Sugarlane B.O.M. Even though I was absent (watching a magnificent local performance of ‘Oliver’ at the Civic Theatre in Townsville), there was some gorgeous stitching happening on Friday Night…. Some stitching repairs by the ever-patient Edi….. 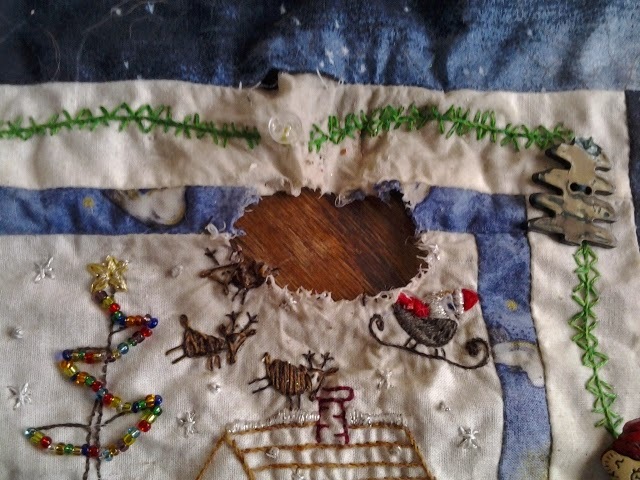 Her gorgeous puppy Nina, must’ve really loved this block so much she could eat it all up! (literally). I absolutely gobsmacked at Edi’s patience in redoing this block….I would have been heartbroken! Cudos to you dear friend! 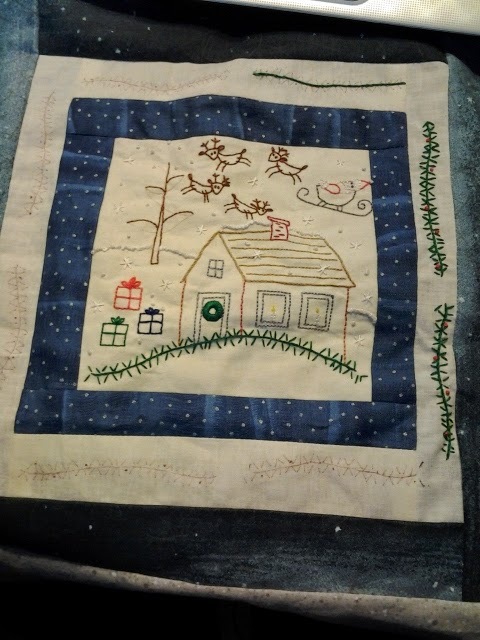 Chris managed to finish her cross stitch for her friend too….Isn’t it absolutely perfect? I”m still popping around to visit everyone, but I will get there. I did manage to get some done before nightfall…. I finished off this cute little fellow that came with one of my latest magazines along with a hexi for our craft groups’ hexi swap. So I didn’t TOTALLY pike out! And I DID manage to gather together two beauties for our prize…..a yummy fat quarter of oilcloth I managed to pick up on my recent trip down to Brisbane and an absolutely p-e-r-f-e-c-t pen and ink fabric illustration by Michelle Palmer……. I ADORE her work. Our lucky winner this month was drawn by our Random King, Mr RNG….and he has chosen …………..
Congratulations to Leanne and I’ll get that prize off to you ASAP! Without further ado…..here is the sneak peek I’ve promised you……my new FREE BOM that will start on April 1…. Well, can you call it a BOM when it’s really a BOF???? That doesn’t quite sound right does it? But that’s what it is….a Block Of the Fortnight! There’s nine blocks plus the finishing instructions which will begin on April 1 and every fortnight for 10 fortnights. Hope you’ll be joining in? Oh my, we have to sleep 9 more times before we can see the BOF/BOM? Unpatiently waiting now, sounds very exciting. Some lovely projects were worked on on Friday night. I think I would have been heart broken too if I'd seen a bite taken out of my block. Well done Edi on re-stitching it. Congratulations to Leanne. So many great projects finished. I am looking forward to your BOM, oh I mean BOF. Congrats to Leanne. Love all your projects. Looking forward to your BOF starting the day before my birthday. Today’s kids were born in the age college paper writing service reviews of the internet. To connect with these kids, teachers must learn to speak their language and become conversant with the technology that comes so naturally to the young. Integrating technology means tapping into student’s interests and strengthening their technical skills, all while providing enriching learning opportunities.